The New York University Archives is requesting a grant to begin a digitization project to provide public access to important and hidden archival records of the football team. In order to best serve users, access needs to be expanded to offer full-digitized versions of the NYU Football Programs online. The New York University Fighting Violets left an under appreciated impact on college football and New York sports history, including developing the modern style of play and forming the NCAA. In addition, football programs are a robust resource for of a rising number of historical disciplines that increasingly rely on the history of college sports to understand American history, society, race, rise of consumer culture, and/or gender studies. Over a two-year period, the Football Program Digital Project would like digitize all the programs currently housed at the NYU Archive, as well as several hundred photos, articles, and related documents for preservation and use. Previous to this proposal, there has been no formal effort to catalog, preserve, or provide direct access to the NYU Football Programs. To remedy that we propose to build an online digital history website and repository by creating and encoding approximately two hundred football programs and hundreds of other records totaling over 3500 individual digital files is the largest digitization project yet undertaken by the NYU Archives. 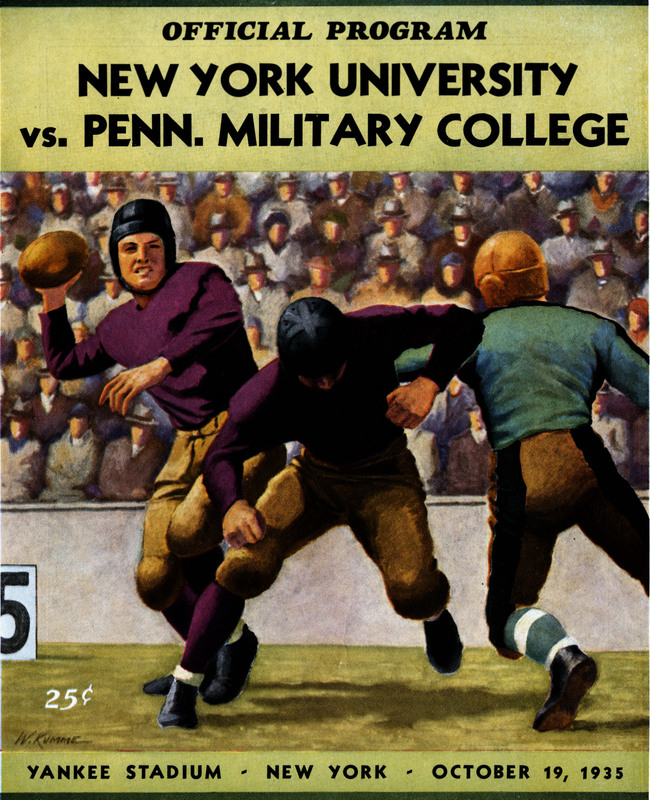 The public website will be the authoritative resource the NYU Football Programs and provide a case study of best practices for the archival profession when dealing with mixed image/text collection. The main goal of the project is to provide access to the original documents through the use of tagging each page image with information users would likely use to explore the football programs. Centered on the programs, the project will feature a number of added value features that best suit the varied needs of interested audiences. I wasn't able to add comments on the page with your index so I am posting here. The structure of your website is very clear. The order of sections makes sense and the drop-down menus will make it easy for users to navigate the site. The “search by” options will also make finding information on your site very efficient. A few questions: Will any users of your site be able to contribute to the discussion boards and the “share your story” section? If they need to apply to gain access, perhaps there should be a log-in page. Also, will users of your website be able to provide feedback? I like very much that the scope of this site is well defined and finite. This doesn't mean it can't grow or develop in unexpected directions, but the purpose and the "story" of the site are clear. In my opinion this produces the most satisfying experience with a website. Even if a accidental visitor arrives knowing little or nothing about a topic, if the boundaries of the topic are clearly defined, one can enjoy the experience of "meeting" a new topic if it is presented clearly and without complication. One suggestion I might make concerns your site navigation. On your bullet-point list of site organization you have several points that might be combined to have fewer headings. This makes the site easier to understand as well as navigate. Also, I noticed that you are developing a top navigation bar and a left navigation bar. This is a good approach as long as it doesn't become confusing. As a general rule, website navigation should be so clear and self-evident as to see entirely transparent. If the top bar and the left navigation aren't clearly related this can become confusing. One way to avoid confusion is to combine the functions of the two such as using the left navigation provide sub-menus for the top bar. It could be this is what you intend but at this stage that isn't obvious. Even though I have no prior knowledge of this topic and I am not generally interested in college sports, I would enjoy visiting the site because of its compact presentation of the topic. Nice job! I look forward to seeing the finished site!